It is growing at an alarming pace, thanks to a projected trillion dollar budget deficit for this year. The Congressional Budget Office recently put out a report warning of “significant negative consequences” to our economy and standard of living from an unchecked rise in the debt to GDP ratio. Mike Gleason: It is my privilege now to welcome in Lawrence Parks, founder and executive director of the Foundation of the Advancement of Monetary Education. Larry has dedicated much of his life towards the study and promotion of sound money, having author articles that have appeared numerous times in publications like The Economist, The Washington Times, National Review, and The Wall Street Journal just to name a few. He even hosts a weekly TV show that airs on cable networks in the Manhattan area called “The Larry Parks Show”. He is given expert testimony in Washington to the United States Congress on monetary policy. He’s a real champion for sound money, and it’s great to have him on with us today. Larry thanks for the time and welcome. It’s good to talk to you. Larry Parks: It’s a pleasure. Thank you for hosting this. Mike Gleason: Well Larry, to set the stage here briefly give us some background about the Foundation of the Advancement of Monetary Education and what motivated you to take the helm of the organization nearly 25 years ago, let’s start there. Larry Parks: I had been in the money management business and I had noticed along the way that I was getting severe distortions in the evaluation of the stocks that we used to cover. And I had known about the money issue, I had studied at one point with Murray Rothbard. And it wasn’t my intention right from the very beginning to do this. I tried to get other charities, other think tanks, to pay attention to this and nobody would touch it. Turns out there’s a good reason for that. Somebody suggested to me along the way “Why don’t you do it?” And I ended up doing it. When we got started, we had all of the work that Committee for Monetary Education and Research did. (They) had several hundred monographs, a couple of which were authored by me. We had all that digitized. The people at The Foundation for Economic Education, that was Harry Stendhal’s at the time. They had all the work of Henry Hazlitt, I don’t know if you remember that name. He was from The Times. He wrote a book called Common Sense Economics and stuff on gold, made all that stuff. I recruited 30 some odd board of advisers and board members, some of them had world-wide reputations, and we were off and running. And I thought that the gold space, especially the gold companies would sponsor our work but that never happened. It’s very interesting how the people on the other side, on the paper money side were able to co-op just about everybody and promulgate this, what I call this imaginary fake money into society on a worldwide basis. It’s just utterly remarkable they got away with this. Mike Gleason: Now you’ve made the point that gold is the most important of all the commodities in the world, even more so than oil. Explain why you believe that to be the case if you would please? Larry Parks: The reason gold is the most important commodity is that gold is the only way to ensure payment. And so the way I like to explain it is that the glue that holds society together is keeping promises. So for example I make up with you I’m going to be available at 3 o’clock today if I don’t keep my promise that hurts the relationship. But the promises that are most important to society, aside from the promises that we make to family and friends, are the promises to pay. To pay pensions, to pay annuities, to pay savings, to pay rents, whatever. If those promises get broken society unravels. And so, what happens is that people who have promises of payment take pensions for example, pensions are really differed wages, they depend on that promise being kept. And in turn they make promises to other people mindful that they’re going to get paid. If that chain gets broken all of the inter relationships in society down and we’ve seen examples of that from all recorded history. The thing about gold is that gold is the only way to ensure payment over a long period. People think about gold as money they think about going to the grocery store, that’s absurd. Nobody would use gold for day to day transactions. Gold is important for payment into the future. And so, whatever it is that you use as money, say for example you use water, some of that water is going to spill. In the case of gold you have no spillage. The guy who really put his finger on this the best is a guy named Carl Menger. He’s part of the so-called Austrian School of Economics picked up on Von Mises by Rothbard and others. And what they said was that gold is the sellable, most efficient money. And the way they measure that, and it’s really ingenious, if you look at all the things that could possibly be money and the things that have been money-like salt, cattle, copper, steel, all kinds of stuff- and you line them all up and you offer ever increasing amounts of each into the marketplace, the commodity for which the by sale spread increases the least that’s the most efficient money. And it just so happens that’s gold. No matter where you drop in in history, either in ancient times or Renaissance times, today, say in the 19th century, cross culture, cross time you see people using gold as money when it’s available. So it’s not like someone came down from the heavens and said “Look in China, in the Mideast, in Europe you have to use gold.” Somehow by trial and error they just figured out that gold is the most efficient money. But again it’s the key to holding society together. Mike Gleason: Our listeners know that the market had chosen gold as the best form of money for thousands of years as you’ve just explained, but it hasn’t been openly used as money in recent decades. Talk about how and why gold was booted out of the world’s monetary system, at least officially. Larry Parks: Well, what’s happened and this also goes back to ancient times, it was generally the rule of rulers of countries that said what the money was going to be. Best case is when the people themselves decided what the money was going to be, but a lot of times the rulers of those countries got involved with coinage. They put their images on it. They set the standards, but a long time ago people at the top of the heap figured a good way to steal was to debase the coinage. So in Renaissance times, when they started having precious metals as money, they used to clip the coinage. In modern times they figured out with things like factional reserve lending that they could really, in effect, debase the money completely. The problem with gold from that point of view is that gold protects the money. So, if you have gold you have what you have. The way I like to say there’s no counterparty risk with gold. With everything else you have counterparty risk that somebody will do something that will damage the value of your currency. For example, if I pay you with a check, Mike, you have counterparty risk that the check may not be good. And if I pay you with a dollar, that we call a dollar today which is not a dollar, but what I call a dollar today you have counterparty risk that the issuing authority in our case it’s the banking system, the Federal Reserve and the banks, will depreciating the purchasing power of that money. And they tell you right out that they’re going to do that. The jargon for that is called inflation targeting. And see, you’re always at risk that after some long period you’re not going to have what you think you have, or you’re not going to get paid what you think you’re going to get paid. However with gold it is what it is. By getting rid of gold they’re able, in effect, to engage in really a massive amount of thievery under the color of law of course where they transfer the wealth of society from the people who earn it — mostly ordinary working people — to the people who are in charge of the monetary system. We’ve developed on this end of the phone data from primary sources in this case the Federal Deposit Insurance Corporation, they have on their website one line for each year going back to 1934 when they got started of all the banking statistics. And up until the last tie to gold was broken, and that was in 1971, the money that went to the banks… and I can send anybody a chart on this if they wish just send me an email larry@larryparks.com… it was a small amount of money. It was a sum number of billions. Since the last tie to gold was broken in 1971 it’s in the trillions. Trillions. In dividends to their shareholders and in trillions in compensation to their employees. That would not be possible with gold. Also, in the sense of the politicians there’s a very important book that people should take the time to read. It’s called “Fragile By Design” it’s by a Columbia Professor and his partner at, I think University of California by the name Steven Haber. It’s called “Fragile By Design” and they document very nicely that there is, on a world-wide basis what they call a grand bargain between the banking systems and the monetary authorities and banks in effect of paper money. When you have paper money you can have unlimited spending. So a lot of people complain about the deficit, about debt and what not. Well with paper money there is no limit to how much money you can spend. And if you have unlimited spending you get unlimited government. And if you have unlimited government the people in charge have unlimited power, they like that. Gold stands in the way. So, what they’ve done at this end in our country is, even though the Constitution guarantees us promises as gold and silver coin as money they’ve pretty much got gold out of the system and they’ve done it right from the get-go. Right from the time right after the Revolution. There’s a ton of stuff from 19th century where they recognize that gold is antagonistic to the paper money. And of course, the way they get you to use it is they force you to use it with what’s known as legal tender laws. Again another abomination. Mike Gleason: There was a recent documentary financed and distributed by The Financial Times and in that piece one of their experts says gold is like “shiny pooh”. He goes on to say that “People who like gold are people who like to play with their pooh.” A silly comment to say the least but on a serious note, how do you explain the disdain for golf among financial elites Larry? Because this individuals comments are quite often shared by many. Larry Parks: I can explain it in four words: gold pays no fees. So the people in the financial world especially on Wall Street, Wall Street is a fee business. So, when people have savings, and a lot of people are concerned, especially people who are at the upper end, they’re concerned about inter-generational wealth transfer, leaving money to their kids. People who retire, who are facing retirement, or plan to retire, they have and issue “How should I allocate my money?” And as far as Wall Street is concerned they want you to allocate it in a way that generates fees for them. In the case of gold really the best thing that people can do for savings for the future is to buy gold, my favorite are U.S. Gold Eagles, and put them away. But if you do that where are the fees for Wall Street? And so, what they’ve done, it’s really incredible what they’ve gotten away with in the pension business. For example, in defined benefit pension plans in America there are roughly ten trillion dollars’ worth of investible assets. Ten trillion. And no gold. The only gold position that I can identify is the Texas Teachers Retirement System. They have a billion dollar position in physical gold out of roughly one hundred and forty billion dollars of investible assets but in the other ten trillion there’s no gold. And they have roughly something on the order of twenty some odd percent, last I looked around twenty-four or twenty-five percent of these assets in fixed income, these are Government bonds and court bonds, on the theory that people are safer. In fact, the icon of American investing, that would be Warren Buffett, he said in one of his chairmen letters from his Berkshire Hathaway company followed up with an article in Fortune Magazine that the most unsafe, the most risky assets are currency denominated assets, and he specifically targets bonds. And the reason they’re unsafe and risky, the only risk you have to be concerned about is that at the end of the holding period that you have less purchasing power than when you started. The answer is that things like fixed income, that’s a guaranteed loser. So how do you explain that you have ten trillion dollars, you have roughly two and half trillion dollars in the most risky most unsafe investment and no allocation to gold. And of course, the answer is, as I’ve said, gold pays no fees. So really what you have here is really cheating people on a massive scale, I mean it’s unbelievable how they’ve gotten away with this. In the last couple years there’s been talk about having these investment advisors having a fiduciary responsibility to their customers, and they defeated that. So basically, the way Wall Street works is that they’re in it for the fees. If the customer gets a good result, that’s a happy accident. So today… and I’ll tell you Mike it’s an incredible scandal, it doesn’t get enough press… there’s one hundred and fifty of these so-called multi-employer pension funds that are on the Department of Labor critical list which is to say they’re bust. And millions of workers are involved, what’s their remedy? What should these people do when they turn 65 or 70, whatever, and they can’t work anymore and their bodies are broken from the work that they used to do and they have no money, how are they supposed to live? So really what’s happening in the country today is that there is, I perceive, a huge lean towards socialism. My view we are at best two election cycles, maybe one election cycle, away from the country going socialist. I don’t know how many people watched the State of The Union Address by President Trump, but he went out of his way to say in very strong terms he said, “We’re not going to have a socialist country.” Now you never heard any other President say something like that. The fact that he felt compelled to say that, they recognize also that there is this lean towards socialism. That would be an enormous tragedy, we are on the glide path right now to Venezuela. Mike Gleason: Switching gears here a little bit, you talk to mining executives and you have your finger on the pulse there, so I want to ask you, do you think they believe there is price suppression in the metals’ markets? And as a follow up, if they believe there is – which to us seems hard to deny at this point – why don’t mining executives cry foul? Because it seems as though their companies would be the most impacted. Is it that they just don’t want to call out the very banks that they’re so depended upon for credit, or is it something else? Because the lack of an outcry for mining leaders has always baffled me Larry. Larry Parks: Well, it’s not only baffling although I’ll give you an explanation for it, but it’s disheartening. These folks have fiduciary responsibility to their shareholders and also to themselves. Except for people like Rob McEwen, very good guy, and Rudi Fronk. Rob McEwen has McEwen Gold, Rudi Fronk at Seabridge. Very few have any kind of material interest in the companies at all. They’re in it for the payroll. In their defense, and it’s not a great defense but it is a defense, they don’t know anything about this business with gold and the monetary system. These guys, I don’t think there’s any women running any of these companies anymore. There was one woman and I think she sold out to Barrick some time ago. I forget her name. But basically, these people went to the Colorado School of Mines or its equivalent. Some of them have accounting degrees and that’s it. Also until recently none of these people were from America. So if you look at all the major gold companies, important gold companies, they were all headed by foreigners. So they don’t know anything about the constitutional issues here in America. Why would they? So right now you have two. You have this fellow John Thornton who just took over a couple years ago at Barrick Gold. He’s an American. And Gary Goldberg who runs Newmont. But before Thornton took over it was Peter Munk. Peter Munk came from Hungary, grew up in Hungary, educated in Switzerland, considered himself a Canadian. Newmont was Jimmy Goldsmith, a Brit. And all the rest are from other parts of the world. No one knows anything about the provisions, the history and it’s really America that’s lead the way on this, not any other kind of country. There’s all a story to this, and I know we only have a few minutes for this podcast, but back in 1944-45 when the Bretton Woods Conference met really the dye was set there to get gold completely out of the system. Roosevelt did his part in 1933, but after Bretton Woods the idea was that the United States dollar would be convertible into gold for foreign governments and foreign central banks. At that time it was still a felony for Americans to own gold. That’s an interesting question you don’t get an answer to. What is the public policy justification for making gold ownership in America a felony? I mean where have you seen that question asked in any economics textbook? Basically the guys that run these gold companies they don’t know about this. Why should they? They’re geologists, they’re mining engineers, it’s not part of their study. Here in America educational system is highly controlled especially at the college level. Nobody gets ahead in economics talking the way I’m talking. The Huffington Post somebody did a study, and it turns out if you want to get ahead in the academy you have to publish. And it turns out that just about all the important economic journals are edited by a president or former employees of the Federal Reserve. You don’t get ahead. So basically, there’s a lack of knowledge, and gold is denigrated and so those quotes that you gave from that Financial Times, imagine the Financial Times sponsoring, and I think that documentary, it’s called something like, “Dangerous Obsessions”… if you go on YouTube you can search those key words, dangerous obsession… it’s just outrageous that an expert should say it’s like pooh. This is really crazy, but that’s the level that we have now. When you start talking about gold people pigeon hold you. They say “You must be a gold bug” which is a derogatory statement. Anyway, as far as the guys who run the mines are concerned they’re interested in salaries. They get good salaries. Like I say, very few of them have any skin in the game and that’s it. They don’t know the vocabulary, they don’t know what you’re talking about, they defer to the World Gold Council which is basically the world jewelry council. That’s been a thorn in my side the whole time I’m at this. Mike Gleason: Yeah that’s I think the conclusion we’ve drawn as well. There’s no great explanation as to why these guys are just sort of completely AWOL when it comes to the suppression schemes. We have had (on our podcast) Keith Neumeyer CEO of First Majestic Silver who is a very outspoken individual when it comes to the manipulation. At least there are some out there that are doing that. Larry Parks: Well the first thing is they’re going to have to invest some of their most valuable resource and that’s their time to learn about this. We have on our website, especially the issues summary. It’s simple to do, there’s a lot of cognitive dissonance here. But we could use introductions, especially introductions to trustees of pension funds. And one of the big opportunities I think to get interest in gold we need to build a constituency for gold in the United States and there is no such constituency today. I think in December it’s a proxy for this, the mint sold something like three thousand gold eagles. That’s nothing. That’s like a tenth of a ton. To put that into perspective for you, the mines produce about three thousand tons a year and there’s roughly two hundred thousand tons above ground. A tenth of a ton is nothing. You know because you’re in the business people keep denigrating gold. So really the opportunity to build a constituency is to get gold into pension funds. I know you know about this Mike, I don’t know if your listeners know about it but we just had three bills that went down in flames in Wyoming. Which were going to compel the state of Wyoming… we had about seventeen representatives out of sixty vote in favor of it. But all of these pension funds are naked. And if these pension funds at least had some gold people would start taking an interest in what’s happened here. And what’s happened will not stand the light of day. Like I said this is just out and out thievery, stealing from ordinary people their future payments. It’s not like they come to your house and take what you have, but really we’re on a glide path to Venezuela as I’ve said. We could use introductions. If the people can’t make a donation refer us to a trustee of a pension fund, any kind of pension fund. And I’m particularly interested in people who run pension funds for organized labor. The reason for that is that organized labor, they employ lobbyists and they have pull. They’re the principle victims so they’re the ones who could really make a difference here. Mike Gleason: Well, it’s certainly been a great honor to speak with you and we greatly enjoyed the conversation. Keep up the great work. You guys are doing fantastic work there. People should go to FAME.org and make a contribution. You’ve just heard from Larry and how he has dedicated a lot of his life to this effort and it’s a very noble one. 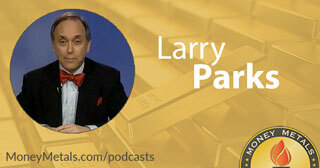 We certainly appreciate you coming on the Money Metals Podcast, take care Larry.